GrabOn Fab5- Participate & Take Home Amazing Gifts! Home Sports and Entertainment GrabOn Fab5- Celebrate & Win Exciting Goodies! 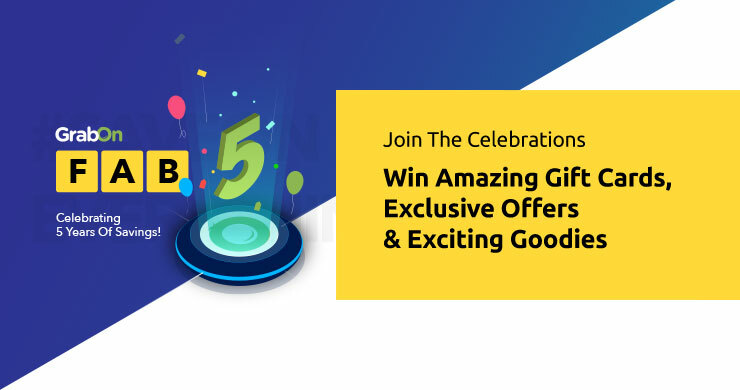 GrabOn Fab5- Celebrate & Win Exciting Goodies! Hip-hip-hooray! This year we finally turn 5 and we would like to thank everyone who has been with us in this! In this journey, we have not only made some unforgettable memories but also saved a lot on online shopping (close to Rs. 50 billion!). Whether it is electronics, clothing or recharge, we have always helped you save on everything. On the occasion of our 5th anniversary, we wanted to do something special for all of you, who have helped us reach this milestone. What’s the best way to celebrate 5 years of savings? More coupons and free gifts, of course! So we decided to surprise you with GrabOn Fab5, where you can participate and take home gift cards, exclusive offers and other exciting goodies! Like GrabOn’s Facebook page and follow GrabOn on Instagram, and Twitter. Get maximum likes (reacts) and comments on your Facebook profile picture as the mega prize winner will be chosen according to most likes (reacts) and comments. All you need to do is add the GrabOn Fab5 frame to your Facebook profile picture and make your profile picture public. 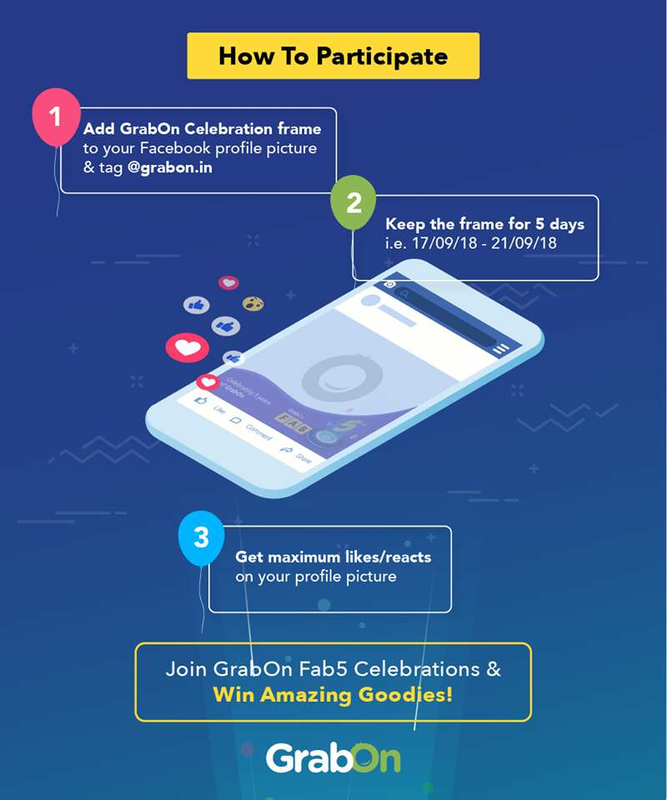 Tag us (our Facebook page) and put this as your caption: Join GrabOn Fab5 Celebrations and win amazing Gift Cards, smartphones, Bluetooth speakers & more! Prizes include amazing gift cards, smartphone, wireless Bluetooth headphones, portable Bluetooth speakers and more. 2. 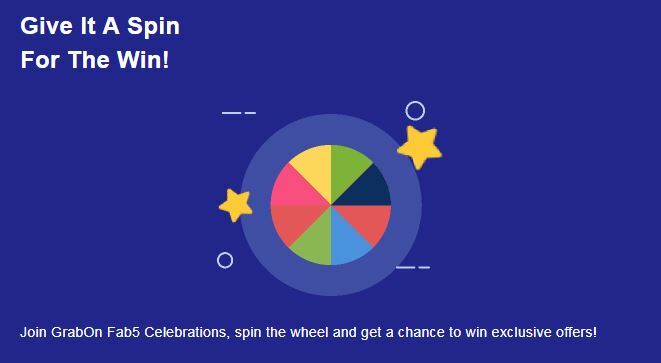 Spin To Win- As the name suggests, spin the wheel and stand a chance to win some of the best offers available, ranging from Myntra, Amazon, Flipkart and much more! Login with your Facebook or Google account to get your coupon code! 3. Anniversary Special Offers- We have some of the best vouchers, gift cards, promo codes, and coupon codes exclusively for you for this anniversary. Look out for the GrabOn badge throughout our website to grab anniversary special offers!. Are you excited to take part in GrabOn Fab5? Let us know in the comments below. Also, let us know what gifts or offers you get so that we can rejoice along with you! For more details, check out our page for the GrabOn Fab5 celebrations!